After crazy weather in early spring, it’s finally time to get out in the fields. We’ve gotten a lot of questions about spring nitrogen lately. Here are the frequently asked questions we get about nitrogen management this time of year. 1. If I applied spring anhydrous, how long after application should I wait to plant? As long as there is separation between the anhydrous band and the seed, you can plant right after application. 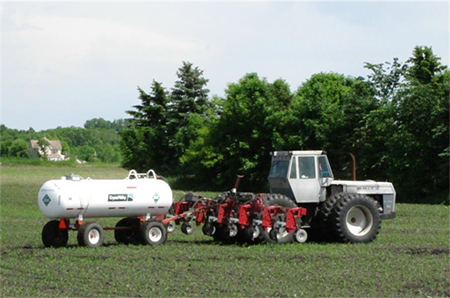 Anhydrous ammonia is a gas at the injection point and immediately after injection into soil the gas will expand and create a high ammonia and ammonium zone in a round shape roughly one to five inches in diameter. The size depends on various factors like soil moisture, texture, and rate of application, but in general, the vertical movement is about two inches towards the soil surface. If you apply anhydrous at a seven-inch depth there is typically enough separation between the ammonia retention zone and where the seed is placed. Another option when using RTK is to apply anhydrous parallel to the future crop-rows but not directly under it. The biggest risk for ammonia injury, when planting right after application, is in coarse-textured soils because the retention zone tends to be larger, dry soils (not a problem this year), or excessively wet soils where you don’t get a good seal or where the knife smears the soil surface. 2. Can I top-dress all of my nitrogen after the crop is planted? Yes, we recommend top dressing for coarse textured soils. For medium and fine textured soils, there are a few factors to consider. Applying a small amount of N as starter would provide risk management in case you are not able to get it applied as soon as planned. If you’ve prepaid for ammonia it may be difficult finding equipment to apply after planting. With urea, you would need a urease inhibitor which adds cost and the same is true for UAN unless you inject the UAN. We would only recommend top-dress for corn after soybeans. Corn after corn ideally needs one-third of the total N at planting. If only a starter rate of N (30 lb or less) is applied for corn after corn, begin applying top-dress as soon as you can row corn. 3. Should I be concerned about nitrogen tie-up when topdressing N under high residue systems? There is a possibility of this happening, particularly if the weather turns out to be cool. This process is called “immobilization,” and occurs when decomposing microbes take N out of the soil to “consume” residue. As the decomposition process advances, the nitrogen will release back into the soil to be used by the plants. The key is to avoid significant nitrogen deficiency stress if this happens. This is another instance where applying a small amount of N (30 lb./Ac.) as a starter would help avoid problems. Volatilization loss is a greater concern for urea than is immobilization, UAN has greater potential for immobilization than urea. 4. What is the best source of nitrogen to top-dress if I have to apply all my N after planting? Any form of readily available N can be used. You can inject either UAN or anhydrous ammonia between rows to reduce plant injury. There is no advantage to trying to apply N close to the row since roots will grow into the row centers by the 4th leaf stage. It is also possible to apply N in every other row instead of every row without negatively impacting yield because every row will have N applied at one side or the other. You can also apply urea with a urease inhibitor (NBPT), UAN dribble on the surface. If you need to, you can apply UAN in a broadcast application when the crop is small to reduce the chance of leaf injury. 5. Should I consider an inhibitor? It is important to understand that there are two types of inhibitors. Nitrification inhibitors delay the process of converting N in the ammonium form to nitrate. This is significant, as the nitrate form is subject to loss via denitrification (gassing off into the atmosphere), or leaching into groundwater. As the season progresses, the likelihood of loss decreases because the amount of time between application and plant use is shorter. This makes the instances of needing an inhibitor less likely. Additionally, as the soil warms the inhibitor will not keep its effect as long in the soil as compared to a fall or early spring application. The bottom line is there is nothing wrong environmentally with using a nitrification inhibitor at this time, but the likelihood of it paying for itself decreases by the day. The other type of inhibitors are urease inhibitors. These are intended to prevent urea from volatilizing and disappearing into the air. The risk of volatilization happening is much greater when urea is top-dressed without incorporation. Use a urease inhibitor in this situation, unless you are certain that there will be a significant rainfall (at least 0.2 in.) in the 48 hours following an application.